I put all my eggs into the narrative basket and lost. In November, I managed to get 5 minutes and 37 seconds with Nick Johnson. I asked him questions and he answered. Together, we came to the conclusion that it didn’t matter what the name of the sandwich he got at beyond bread was, but only that he enjoyed it. When we pivoted to basketball, he had glowing things to say about the progress of Gabe York and the contributions – to his career – of Kyle Fogg. Nick is a bright and thoughtful kid. I thought I had a nice article brewing. And then I asked him about goals. I like goals. I’ve played sports my whole life and we used to set them there. I have a job and we set them there. I have a life and I set them there. Goals, as it were, have a tendency to help us achieve things. Sometimes we don’t always reach them, but so long as we try – we try real hard – we can’t soon be called a loser. That Thursday afternoon, when I asked Nick Johnson what his personal goals were, he told me, “Defensive player of the year.” Immediately I wanted to text my brother. Holy hell! If Johnson was to be the best defender, then Arizona was surely to be the best defenders, and my goodness were they going to be good. Mid-interview, as a professional courtesy, I didn’t text my brother. But my excitement surrounding his remarks got me thinking that maybe I was sitting on something bigger than just a nice preview. I followed the personal goals question by inquiring as to the team goals. “We want to win the Pac-12 regular season. And then on to the tournament, the Pac-12 tournament and eventually get to a Final Four. And then after…” Here’s where he briefly paused. Then smirked. I think I was sitting calmly in my seat, if memory serves me correctly, but I cannot, confirm this. One can only hope that Johnson didn’t notice the fandom oozing out my pores. You can kind of see it, another A and another swoosh. But also on there was a year, 1997 to be exact, noted on the sleeve patch. That’s the last and only time Arizona won a national title. After noting that his team was trying to get to a Final Four, I had an opportunity to jump back into the conversation. He smiled again, the consummate team guy, and told me, “Everything will take care of itself.” I thanked him for his time, we parted ways, and I texted every Wildcat fan in my phone. But I never wrote the story. Like I said, I put this egg in the narrative basket, gambling everything would take care of itself, and it didn’t. Or at least not the way that I had imagined it. Arizona never made that Final Four. They didn’t even win the Pac-12 tournament. Nick Johnson was not your Pac-12 Defensive Player of the Year. He was the Player of the Year. The conference’s best player on their best team. He became an All-American and Wooden Award Finalist. I had asked Nick Johnson what his goal was and then I got to watch this kid obliterate that goal. That’s just great. And yesterday he declared for the NBA draft. It’s a decision I don’t necessarily agree with but that’s the opinion of the same guy who nearly texted everyone who knew while interviewing Johnson. A totally rational move (sarcasm font). We talked about his goals and he exceeded some with flying colors! He had about as complete a season as a college basketball player could have. But similar to how it all changed on 2/1, Johnson’s decision leaves us with a lot of ‘what ifs’ that will ultimately A) not be answered until at least November, and B) perhaps never be answered. Indubitably, Arizona would have had one of its most talented rosters the school has ever rolled out had Johnson stayed. As it were, he’s projected as the 20th PG or SG taken (second round) and the sixth Pac-12 player picked. Also to note, that same projection has seniors Shabazz Napier (1st round) and Russ Smith (2d round) picked ahead of Johnson. “He’s not in lala land” — Miller said, about Johnson knowing he might not be a high pick. The kid could come back. This was a very tough decisions. But if we’re going to premise this whole thing on goals, I think Nick sees his: the NBA. I also won’t soon assume to know what back room conversations were had or promises made. I won’t assume to know his rationale or decision making process. What I can tell you is that I asked a kid about what he wanted to accomplish and then he bested that. Color me impressed. But that’s nothing knew with how I’ve long perceived Nick Johnson. And I guess this is that strange, beautiful, awkward part of college sports. We know these players enter for a finite tenure. Nick Johnson isn’t leaving to take Steinbrenner money. He isn’t taking his talents to a superfriendship and breaking our hearts in Akron. Nick Johnson has had a goal to play at the highest level of the game he loves. How much can we really begrudge him this departure? Yeah I selfishly want to see more of him in cardinal and navy. His presence would bring Stanley Johnson off the Wildcats’ 2015 bench. Maybe he’s leaving to be fair to everyone else? Like I said, I think there was more for him to accomplish in Tucson. And I wanted to cheer it, fulfill the narrative I had hoped would manifest. But there’s even more for him to accomplish outside of Tucson. He’s off to do that. Here’s to hoping Nick Johnson keeps exceeding his goals. 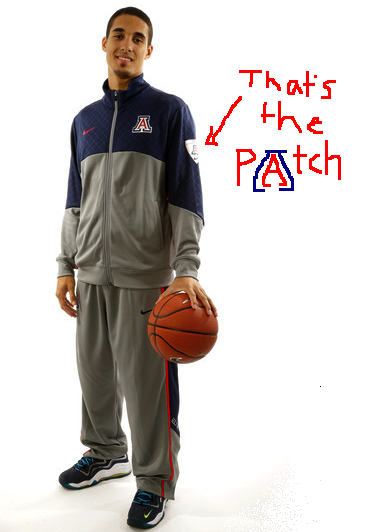 And Arizona puts another patch on that jacket.